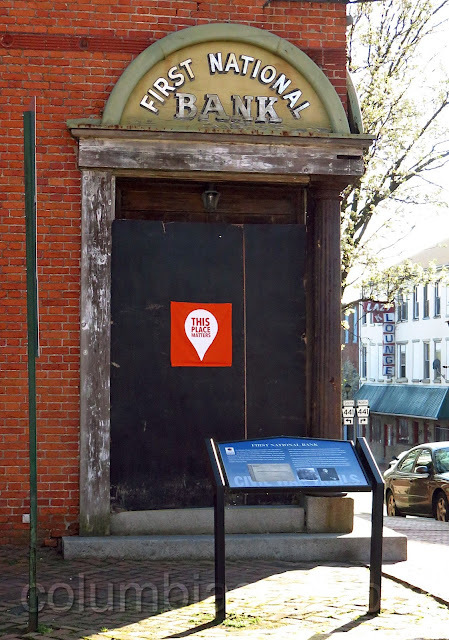 The First National Bank Museum at Second and Locust recently began displaying a "THIS PLACE MATTERS" logo, which is part of a campaign sponsored by the National Trust for Historic Preservation for Preservation Month in May 2016. According to the Trust's website: "Everyone has places that are important to them. Places they care about. Places that matter. 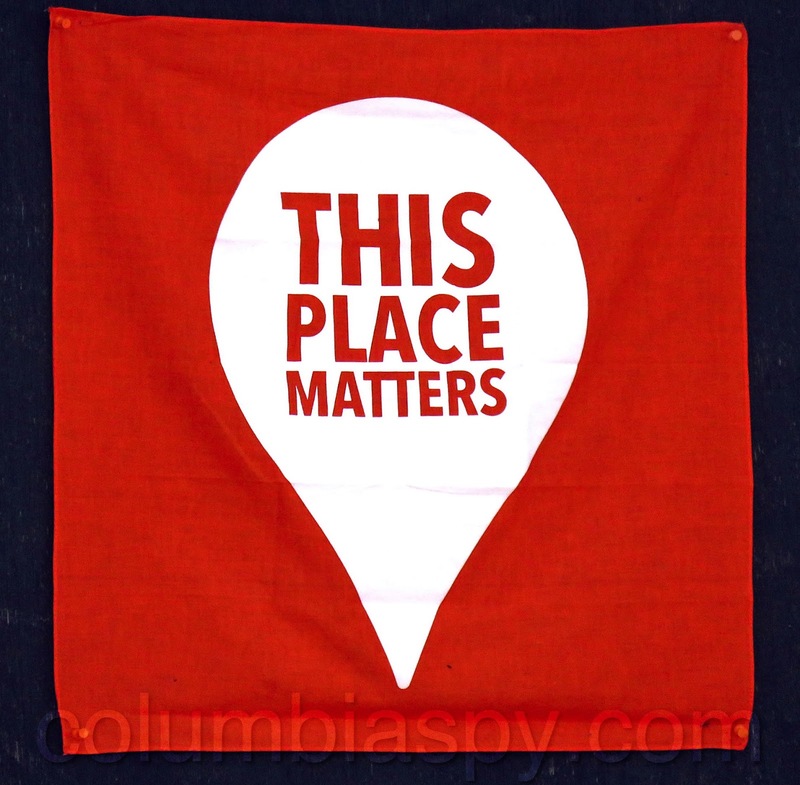 This Place Matters is national campaign that encourages people to celebrate the places that are meaningful to them and to their communities." A beautiful building! Thanks Nora for keeping it otherwise it may have fallen into the wrong hands and become another slumlord's property. What a joke! Sadly it matters more to the community than it does the owners. 15 plus years of plywood, really? Yes it matters, yes it's awesome that Nora still maintains it!! The doors are no one's concern unless your the owner. How dare you be so sarcastic without knowing the facts behind preserving the DOORS. Is it a public safety hazard of egress since it is open to the public? maintains it? surely you jest. the doors have been like that for at least 15 years. it's not like it s been 2. the downtown is coming alive but this is an eyesore. not sure why the codes dept can't do anything about it. i don't think her parents would be trilled with it. If you worry about the doors, how about the big eyesore up the street. 10 months and nothing done. Has he pai the boro any money yet towards the flagger force group that directed traffic? I believe he was going to reimburse the boro. I heard he won't be paying the boro back. He didn't hire them, the boro did and it was unnecessary since the building didn't fall. The boro overstepped the boundaries on this one. I generally don't respond on these things. But, as an outsider looking in, the plywood, spray painted black cover over the doors IS ugly. It has been like this for many, many years. It's ridiculous. Fix them, replace them, apply for grant money, whatever. They could have an awesome business with bank tours with all these out of towners/staters. At the same time, the code dept SHOULD DAILY do a drive thru or walk thru of the downtown area - like the 100-200-300-400-block of Locust St. Cite for trash and rubbish laying all over the sidewalk weekly and NOT in cans with lids, cans that sit all for days at a time, weeds on sidewalk, dog waste on sidewalks, or porches that look like perpetual yard sales. It's WAY past time to let ALL offenders know, that the Boro will NOT tolerate the trash, rubbish, filth anymore. *On a positive note, I love driving the downtown area in the evening and at nighttime, love to see all the properties who leave exterior lights on, wish ALL would do it. The new street lights do NOT throw off anywhere near the same amount of light. Some areas are very dark. It may not be attractive but the plywood is protecting the Original Doors. Restoring them will cost a bit. Replacing them should not even be considered. Can anyone imagine the effort it takes to maintain the rest of that property? I'm sure if it was such a simple and affordable restoration it would be done. Grant Money,,,, I'll let that one pass. Let go of the bank museum and yes follow up with the rest 9f the problems listed. Again, it's great we still have the Bank Museum!! Thank you! Perhaps a fund raiser is in order with proceeds going towards the restoration,, with no strings attached. I admire your determination and miss MOTTERS PAINT STORE. I'm just happy that it's still a bank museum. Columbia should be thanking YOU!!!! Are you kidding me Nora? I agree the comments about your parents are unwarranted and hurtful as many of the comments are. But seriously, the plywood has been there for over 15 years. At this point you have to make an educated decision to fix the doors as best you can with materials readily available. Instead of waiting for 200 year old black walnut wood to miraculously appear. Please, with all due respect, fix them ASAP and be rid of the plywood. Mind your own business and keep your uneducated, nasty opinion to yourself, ANONYMOUS! 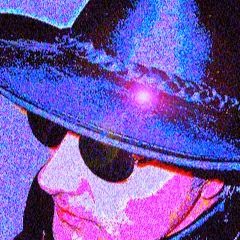 That IS my business Bob as I am a tax paying resident with a vested interest that all codes and ordinances be followed by ALL! Educate yourself and learn the ordinances on the books in this borough.